Chester Arthur Burnett, better known as Howlin’ Wolf, was among the greatest architects of early electric blues, a seminal presence not only in blues history but in the development of popular music in the last half of the twentieth century. A recording star through much of the 1950s and 1960s at Chicago’s Chess Records, Burnett, who tailored the field hollers and folk blues of his upbringing to the amplified, small ensemble settings of a nascent postwar blues scene, also wielded direct influence on a generation of blues-indebted rock performers, especially those of the British Invasion. Though Burnett was skilled on harmonica and guitar, his main instrument was his voice, one of the most distinctive in all of blues. Informed by such models as Charley Patton, Tommy Johnson, and Jimmie Rodgers (as well as the ravages of childhood tonsillitis), Burnett treated his singing as if it were the amp-distorted equal of the guitar and harmonica in urban blues combos. His range ventured from guttural growls to a falsetto moan that played up his stage name (hinting as well at the rich tonal masking of voice modifiers in some African cultures). Sun Records founder-producer Sam Phillips, a lover of unique voices, proclaimed Howlin’ Wolf his greatest find. Standing 6ʹ3ʺ and weighing close to “three hundred pounds of heavenly joy,” as he famously described himself, Burnett was both literally and figuratively larger than life, performing with an oft-noted visceral energy and abandon—crawling on all fours one minute, climbing stage curtains the next—in an embodiment of the blues that made for both legendary theater and cathartic ritual. Named after the twenty-first president of the United States, Burnett, the son of a sharecropper, was born on 10 June 1910, in White Station, near West Point, Mississippi. His parents separated when he was one, and he lived for a time with his mother, Gertrude Jones, and then a great-uncle. His maternal grandfather, who would frighten the boy with tall tales of wolves in the area, gave him his nickname, which stuck after Funny Papa Smith had a 1930 hit with “Howling Wolf Blues.” At thirteen Burnett went to live with his father, Leon “Dock” Burnett, on the Young and Morrow Plantation, near Dockery Farms. As a result, Burnett came into contact with Delta blues giant Charley Patton, who mentored the teenager musically—the first song he learned on guitar was Patton’s “Pony Blues”—and Burnett built on several elements of Patton’s playing, from a gruff vocal style and the preference of riff-based blues structures to a strong sense of showmanship. Burnett also picked up ideas and techniques from other regional players as well as recordings, notably those by Tommy Johnson. One of Burnett’s more fruitful relationships was with Sonny Boy Williamson II, who had married Burnett’s stepsister, Mary, and who taught him how to play the harmonica. Williamson and Burnett would later play on Chess Records. Throughout the 1930s and into much of the 1940s Burnett farmed in Mississippi and Arkansas, working also as a musician both in solo contexts and with other players including Williamson, Son House, Willie Brown, and briefly Robert Johnson. In 1941 Burnett enlisted in the US Army, and he was honorably discharged in 1943, having been stationed stateside the entire time. He returned to farming but by 1948 had moved to West Memphis, Tennessee, where in 1950 he began performing and pitching products on radio station KWEM in a fifteen-minute slot on Monday through Saturday afternoons. There, he assembled his first band, the House Rockers, in which such Memphis/Mid-South electric blues pioneers as James Cotton, Junior Parker, Auburn “Pat” Hare, Matt “Guitar” Murphy, and Willie Johnson all came through the ranks. Phillips, who had recently set up his Memphis Recording Service, learned of the Wolf and brought him into the studio in 1951. At age forty Burnett was far older than most musicians launching their careers, but Phillips was so impressed he used nothing less than gospel song hyperbole to describe Burnett’s music: “This is where the soul of man never dies.” Burnett recorded for Phillips for little more than a year, with his efforts, including his first single, “Moanin’ at Midnight,” licensed to Chess. Unbeknownst to Phillips, Ike Turner, who played with Wolf on some of his recordings, had also negotiated a deal for Burnett with Los Angeles label RPM. That debut, a not-so-sly remake called “Morning at Midnight,” fueled litigious ire, and after some negotiation Burnett ended up at Chess, while another Phillips client, Rosco Gordon, went to RPM. 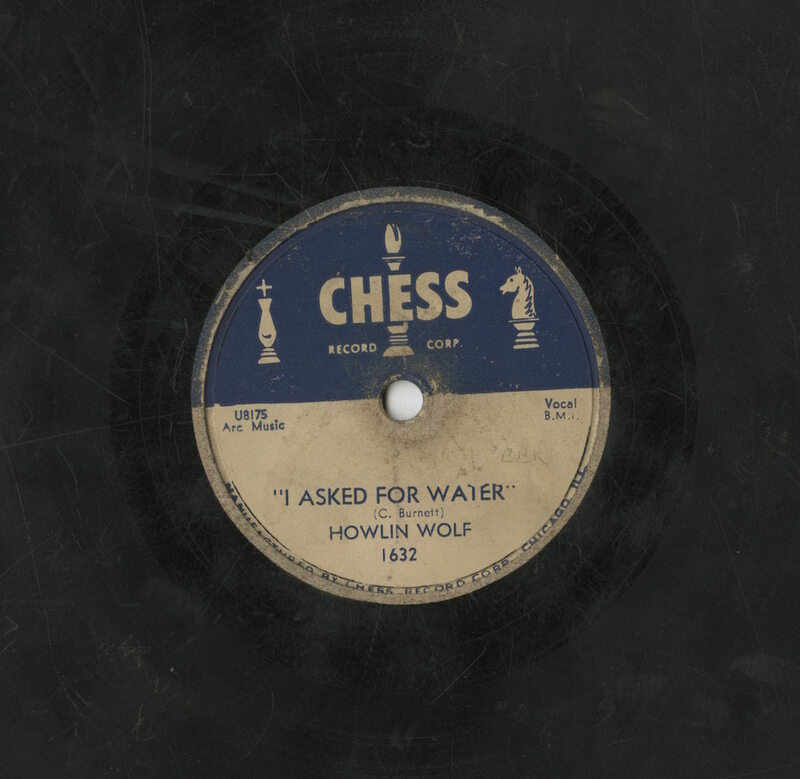 To ensure their investment, Chess relocated Burnett to Chicago in 1953, and he became a bona fide titan of the electric blues scene alongside peer and rival Muddy Waters. Burnett’s repertoire at Chess was a combination of songs culled from the Delta blues tradition and his own rural past (“Sitting on Top of the World,” “I Asked for Water”) and those provided him by Chess songwriter and session bassist Willie Dixon (“Hidden Charms,” “Built for Comfort,” “Three Hundred Pounds of Joy”), who sometimes tricked Burnett into recording songs by saying that they were going to Muddy Waters instead. Among other milestone recordings were 1961’s “The Red Rooster” (which became a United Kingdom No. 1 covered by the Rolling Stones) and his signature tune at Chess, the 1956 classic “Smokestack Lightnin’.” Burnett’s stylistic shift from country to city is particularly notable in the latter song, which he performed as early as the 1930s and first recorded in 1951 for RPM as “Crying at Daybreak.” What began as a rural field holler set to loose, open-ended ensemble riffing in the RPM version became dramatically more standardized and arranged if no less compelling, the metamorphosis of a still largely rural blues into a fully realized expression of the city. Lyrically, the central image of a train’s smokestack reflects the changeover, the perfect industrial, migratory metaphor for this new urbanized form of music. A “compulsive performer,” in the words of Peter Guralnick, Burnett remained active to the end, playing blues clubs and festivals and opening for rock acts. He joined a number of his devotees, including Eric Clapton and members of the Rolling Stones, for a 1970 album, The London Howlin’ Wolf Sessions. After years of declining health, including several heart attacks and dialysis for kidney problems, Burnett died on 10 January 1976 after complications from brain tumor surgery. He has been inducted into both the Blues and Rock and Roll Halls of Fame.